"The veterinarian opens it up, looks at the bones, says, 'Wait a second. These aren't animal bones. These are human bones.'" 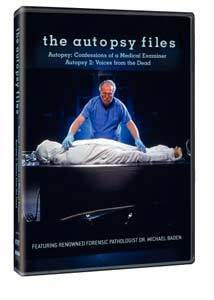 The perfect show for fans of both CSI and the Faces of Death films, Autopsy premiered as part of HBO's America Undercover series way back in 1994. This was the first time we met Dr. Michael Baden, the "star" of Autopsy, a medical examiner who has been a part of some of the most important forensic investigations the world has ever known. Baden isn't the host of the show, as there is a separate, Unsolved Mysteries-esque narrator, but his commentary about each of the individual cases adds incredible insight and legitimacy to even the most ludicrous of situations. The initial DVD appearance of this show arrives in the form of The Autopsy Files, containing the first two episodes of this groundbreaking series. The first is titled, Confessions of a Medical Examiner, and really gets the series off on the right (dead) foot. Some truly fascinating, amazingly true stories are covered, including the very first story about Joan Bent, whose frozen body was found in 1986. The incredible way that Baden's analysis of Bent's stomach contents is used to find her killer has to be seen to be believed. There really isn't a disappointing segment in the initial episode, with a piece that will appeal to just about everyone's (who can stomach the material) taste. Being a die-hard baseball fan, I was drawn to the Billy Martin segment, exploring his mysterious fatal truck accident on Christmas Day in 1989. I vaguely remembered this sad occasion (perhaps I was still on Cloud 9 after my Oakland As won the World Series that year), and had no idea that there was even a suggestion of foul play involved in this apparent accident. Segments about The Attica Prison Riots, the Green Haven Murderer (the investigation of a dead female prison guard with mysterious teeth marks in 1982), and The 5,000 Year Old Man are also in the first episode, but the best segment of all focuses on The Tinning Deaths. Mary Beth Tinning had nine children, all of which died during a 14-year span. The deaths were written-off, with SIDS (Sudden Infant Death Syndrome) as the official cause. Dr. Baden wasn't satisfied with these diagnoses, and was disturbed that this couple continued to have kids, when it seemed certain that each new child would die young. After intense investigation of the children's bodies, the result is both sad and compelling at the same time. As a father, this was also the most difficult 10 minutes of television I've even seen, yet it was like watching a car wreck since it was impossible to take my eyes off of the screen. The disc's other episode, Voices from the Dead, features more of the same formula, but entirely different cases. There really isn't a major stand-out segment that touches a nerve like The Tinning Deaths does, but there's plenty here to give you a few sleepless nights. Those who don't like bugs of any kind (myself included) might want to avoid the first segment, Maggot Mystery, but the next piece on The Cavaness Murders will get your blood boiling with hatred for its focal point. The Angel of Death hit home, literally for me, as it took place in Cincinnati, and Ron Settles' story will appeal to sports fans. Still, the one segment that shouldn't be missed in this episode is the story of a Fun-House "Dummy". When a film crew was scouting a fun house in Long Beach, California, they came across a dummy whose arm easily broke off. This led to an investigation that uncovered the grisly truth about what this "dummy" really was. It's my pleasure to note that a brand new episode of Autopsy is airing this month on HBO. There's a unique spin on this new entry in the series, as the two parts of this show came about from entries to the "Ask Dr. Baden" interactive component to the Autopsy website. HBO contacted the people behind the two most compelling emails, and Dr. Baden and his fellow forensic scientists applied the show's formula to the cases. The work doesn't stop there with Baden, as he is also the co-author of the new book, the cleverly titled, Remains Silent. Image Transfer Review: Both of these episodes are presented in their original full-frame formats, and they look very good given that they're over 10-years-old. The overall quality varies from segment-to-segment, but the only real problem is a bit of noise that is apparent during a few sequences. Otherwise, blacks are appropriately deep, and shadow levels are true, while the color scheme is well rendered. Audio Transfer Review: The audio is Dolby Digital 2.0, and is basically what you would expect from a dialogue-heavy, documentary-style TV show. Everything stays up front for the most part, with Dr. Baden and the narrator's speech always coming across crisp and distinct. Extras Review: There aren't any extras at all on this disc. Reality TV has taken on a new meaning since the 1994 premiere of HBO's Autopsy, but with HBO's first DVD release of the show, we have a chance to rediscover how this television genre should be. To heck with the Survivor's and The Real World's out there, we need more shows like Autopsy, as it actually serves a societal purpose in that its style of forensic investigation can put killers behind bars. It's great to finally have Autopsy on DVD, and HBO Home Video does a decent job with the technical aspects of the disc, but falters in the extras department.